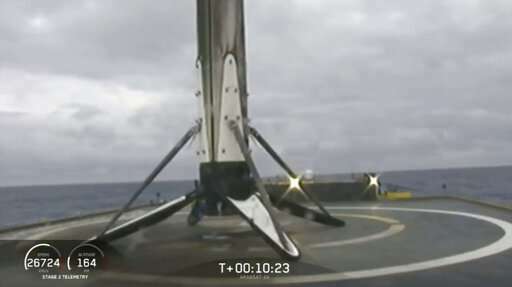 A SpaceX rocket booster that landed on an ocean platform after last week's launch has been damaged in rough seas. For the first time, all three first-stage boosters landed upright following Thursday's launch of the company's Falcon Heavy, the most powerful rocket in use. Both side boosters returned to Cape Canaveral, Florida, while the core booster landed on a platform hundreds of miles offshore. The company confirmed Tuesday that the unsecured core booster toppled onto the platform over the weekend, as waves reached 8 to 10 feet. SpaceX chief Elon Musk says the engines seem OK. There's no immediate word on how many of the booster pieces remain on board. Musk says custom devices to secure the booster weren't ready in time for this second flight of the Falcon Heavy.